In physics, the gyromagnetic ratio (also sometimes known as the magnetogyric ratio in other disciplines) of a particle or system is the ratio of its magnetic moment to its angular momentum, and it is often denoted by the symbol γ, gamma. Its SI unit is the radian per second per tesla (rad⋅s−1⋅T−1) or, equivalently, the coulomb per kilogram (C⋅kg−1). The term "gyromagnetic ratio" is always used as a synonym for a different but closely related quantity, the g-factor. The g-factor, unlike the gyromagnetic ratio, is dimensionless. For more on the g-factor, see below, or see the article g-factor. The derivation of this relation is as follows: First we must prove that the torque resulting from subjecting a magnetic moment to a magnetic field is . The identity of the functional form of the stationary electric and magnetic fields has led to defining the magnitude of the magnetic dipole moment equally well as , or in the following way, imitating the moment p of an electric dipole: The magnetic dipole can be represented by a needle of a compass with fictitious magnetic charges on the two poles and vector distance between the poles under the influence of the magnetic field of earth . By classical mechanics the torque on this needle is But as previously stated so the desired formula comes up. Note as an example the precession of a gyroscope. The earth's gravitational attraction applies a force or torque to the gyroscope in the vertical direction, and the angular momentum vector along the axis of the gyroscope rotates slowly about a vertical line through the pivot. In the place of the gyroscope imagine a sphere spinning around the axis and with its center on the pivot of the gyroscope, and along the axis of the gyroscope two oppositely directed vectors both originated in the center of the sphere, upwards and downwards Replace the gravity with a magnetic flux density B. The angular precession frequency has an important physical meaning: It is the angular cyclotron frequency. The resonance frequency of an ionized plasma being under the influence of a static finite magnetic field, when we superimpose a high frequency electromagnetic field. where μB is the Bohr magneton. The gyromagnetc ratio for the self-spinning electron is twice bigger than the value for an orbiting electron. The g-factor and γ are in excellent agreement with theory; see Precision tests of QED for details. Since a gyromagnetic factor equal to 2 follows from the Dirac's equation it is a frequent misconception to think that a g-factor 2 is a consequence of relativity; it is not. The factor 2 can be obtained from the linearization of both the Schrödinger equation and the relativistic Klein–Gordon equation (which leads to Dirac's). In both cases a 4-spinor is obtained and for both linearizations the g-factor is found to be equal to 2; Therefore, the factor 2 is a consequence of the wave equation dependency on the first (and not the second) derivatives with respect to space and time. Here, 1/2 σμν and Fμν stand for the Lorentz group generators in the Dirac space, and the electromagnetic tensor respectively, while Aμ is the electromagnetic four-potential. An example for such a particle, according to, is the spin-1/2 companion to spin-3/2 in the D(1/2,1)) ⊕ D(1,1/2) representation space of the Lorentz group. This particle has been shown to be characterized by g = -2/3 and consequently to behave as a truly quadratic fermion. The sign of the gyromagnetic ratio, γ, determines the sense of precession. 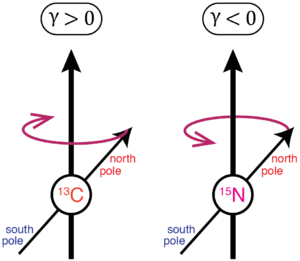 Nuclei such as 1H and 13C are said to have clockwise precession, whereas 15N has counterclockwise precession. While the magnetic moments shown here are oriented the same for both cases of γ, the spin angular momentum are in opposite directions. Spin and magnetic moment are in the same direction for γ > 0.
where is the nuclear magneton, and is the g-factor of the nucleon or nucleus in question. The gyromagnetic ratio of a nucleus plays a role in nuclear magnetic resonance (NMR) and magnetic resonance imaging (MRI). These procedures rely on the fact that bulk magnetization due to nuclear spins precess in a magnetic field at a rate called the Larmor frequency, which is simply the product of the gyromagnetic ratio with the magnetic field strength. With this phenomenon, the sign of γ determines the sense (clockwise vs counterclockwise) of precession. ^Note 1 : Marc Knecht, The Anomalous Magnetic Moments of the Electron and the Muon, Poincaré Seminar (Paris, Oct. 12, 2002), published in : Duplantier, Bertrand; Rivasseau, Vincent (Eds. ); Poincaré Seminar 2002, Progress in Mathematical Physics 30, Birkhäuser (2003), ISBN 3-7643-0579-7. ↑ For example, see: D.C. Giancoli, Physics for Scientists and Engineers, 3rd ed., page 1017. Or see: P.A. Tipler and R.A. Llewellyn, Modern Physics, 4th ed., page 309. ↑ B Odom; D Hanneke; B D'Urso; G Gabrielse (2006). "New measurement of the electron magnetic moment using a one-electron quantum cyclotron". Physical Review Letters. 97 (3): 030801. Bibcode:2006PhRvL..97c0801O. doi:10.1103/PhysRevLett.97.030801. PMID 16907490. ↑ NIST: Electron gyromagnetic ratio. Note that NIST puts a positive sign on the quantity; however, to be consistent with the formulas in this article, a negative sign is put on γ here. Indeed, many references say that γ < 0 for an electron; for example, Weil and Bolton, Electron Paramagnetic Resonance (Wiley 2007), page 578. Also note that the units of radians are added for clarity. ↑ Greiner, Walter. Quantum Mechanics: An Introduction. Springer Verlag. ISBN 9783540674580. ↑ E. G. Delgado Acosta; V. M. Banda Guzmán; M. Kirchbach (2015). "Gyromagnetic gs factors of the spin-1/2 particles in the (1/2+-1/2−-3/2−) triad of the four-vector spinor, ψμ, irreducibility and linearity". International Journal of Modern Physics E. 24 (07): 1550060. arXiv:1507.03640 . Bibcode:2015IJMPE..2450060D. doi:10.1142/S0218301315500603. 1 2 M H Levitt (2008). Spin Dynamics. John Wiley & Sons Ltd. ISBN 0470511176. 1 2 Arthur G Palmer (2007). Protein NMR Spectroscopy. Elsevier Academic Press. ISBN 012164491X. ↑ M A Bernstein; K F King; X J Zhou (2004). Handbook of MRI Pulse Sequences. San Diego: Elsevier Academic Press. p. 960. ISBN 0-12-092861-2. ↑ R C Weast; M J Astle, eds. (1982). Handbook of Chemistry and Physics. Boca Raton: CRC Press. p. E66. ISBN 0-8493-0463-6.